— People don’t look for mountain properties in the Winter. — Let it “rest” off the market and re-list it in MLS so it will be fresh again. The fact is, this strategy was successful 10 years ago…but today? The Internet has changed everything. 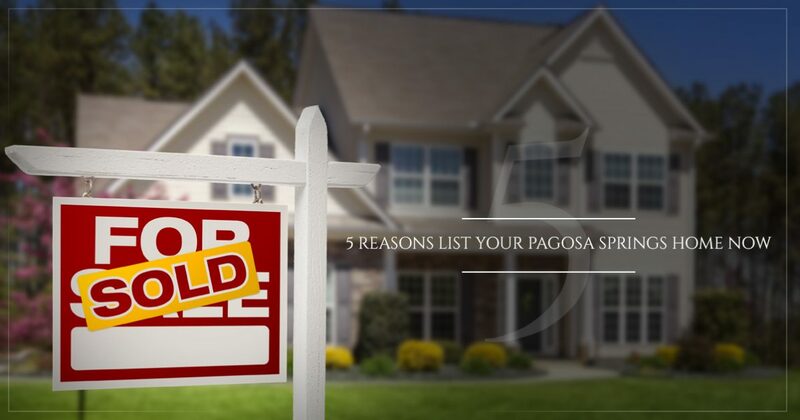 We are not only marketing your Pagosa Springs home for sale in MLS. Galles Properties’ Pagosa Springs real estate listings are uploaded to hundreds of websites. How does your property stand out? We believe that the longer it’s listed – the better it’s position. So let’s look at the top-5 reasons you WANT to list your property in the Winter. The Internet Never Sleeps. Our Clients are searching 7 days a week, 24 hours a day, 365 days a year. Period. Some of our coldest months bring in our largest amount of web search traffic – because people are inside! And if you want them to find your home – it has to be listed. Even in the Winter. Area Real Estate Agents have short-term memory. An Agent down the road has a client visit in January who is perfect for your home. If it’s not listed – it won’t be shown. The Internet has long-term memory. It takes effort, time and money to keep Galles Properties Pagosa Springs Real Estate listings at the front of the pack on the Internet search pages. The longer your listing is on the Internet – the more legs it has and the faster it will rise to the top when people are searching. The sooner we get your home on the internet, the faster we can build it’s search “equity” – once you take it off it has to start all over again. Third Party Sites Are Not Always Your Friends. Plenty of third party sites will show a complete listing history of your property, including price history, when it was on and off the market, even satellite photos. But this data is pulled from sources that are not always reliable. Unless your home is listed with us, we cannot work with these sites to help to maintain accuracy. We Work Year-Round. We live in a Tourist-based economy – and the perfect prospect for your home may be right around the corner. Our office is fully staffed 7 days a week. If you are considering taking your property off the market – take a deep breath – and call your Galles Properties Real Estate Broker. Ask them to review a current Market Report with you – so that together you can make an informed decision about the strategy moving forward. We are here to help.